This month’s Magical Buffet Mythology is chock full of Chacs…and Chac. Confused? Welcome to the religious practices of the Mayans. Chacs are minor rain deities. Initially there were four Chacs, one for each of the directions, north, south, east and west. How many are there now? You tell me, I can’t find two sources that can agree. Chacs appear to look like old men and animal hearts were sacrificed to them during festivals. The Chacs answer to Chac, the rulers of all the minor Chacs. That makes him THE rain god and patron of agriculture. He is often shown wearing a mask and holding an ax. During festivals humans, particularly children, were sacrificed to him to ask for rain and to receive prophecy. Yes, unlike my Tanit article where the sacrifice was unconfirmed, humans were sacrificed to Chac. We all know that I’m not an expert. We all know that, don’t we? Well, I am not, so take this as the uninformed opinion that comprises 98% of what I write. Is human sacrifice cruel? Yes. Should human sacrifice be practiced in modern times? No. 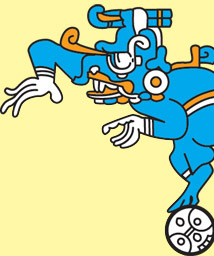 Were the Mayans a bunch of barbarous evil doers? Absolutely not. Spiritual belief exists to provide people with answers. As the world grows smaller and science makes advances spirituality exists to provide answers to internal questions; questions of morality and a quest to understanding ourselves and the divine. There was a time when the world was large, complex, and filled with mysteries. A few important questions like, why does it rain? How can I guarantee rain to sustain my people? That’s where Chac and his Chacs come in. How do we show Chac that our desire is strong? That we’re willing to put our trust in him? Perhaps by sacrificing the untapped potential of our young? Cruel, yes, but it does convey a strong message. So let’s leave the sacrificing in the past, but cut Chac, Chacs, and the Mayans a little slack.